WASHINGTON, DC, February 10, 2011 (ENS) – A majority, (62%) of House Energy and Commerce Committee Chairman Fred Upton’s constituents surveyed in a public opinion poll last week oppose his bill that would remove the U.S. EPA’s power to regulate climate-warming greenhouse gases. The EPA is preparing the country’s first regulations limiting greenhouse gas emissions from power plants and refineries. 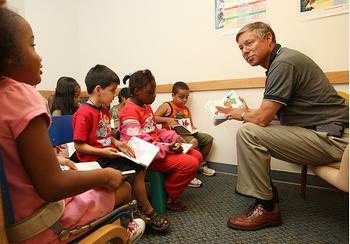 The Public Policy Polling survey of voters in Congressman Upton’s Michigan district, conducted for the Natural Resources Defense Council, found that 67 percent – including 60 percent of Republicans – agreed with the statement that “Congress should let the EPA do its job,” as opposed to the minority who believe that “Congress should decide” what actions are taken to curb carbon pollution. Upton is holding hearings in his committee this week with respect to the draft discussion bill. “Chairman Upton and other members of the House Energy and Commerce Committee will now be hard-pressed to ignore the fact that their constituents want Congress to let the EPA do its job of safeguarding the health of American families,” said Altman. The PPP survey of 595 registered voters in Michigan’s 6th congressional district was conducted February 4-5, 2011 and has a margin of error of plus or minus four percent. Surveys of voters in the home districts of eight other key committee members turned up similar findings. Voters were polled in the districts of five Republicans: Reps. Mary Bono Mack of California; Cory Gardner of Colorado; Adam Kinzinger of Illinois. ; Charlie Bass of New Hampshire; and Leonard Lance, of New Jersey; and three Democrats: Mike Doyle of Pennsylvania; Charles Gonzalez of Texas; and Gene Green of Texas. In every district, a majority of those surveyed agreed with the statement that “Congress should let the EPA do its job.” The majority percentages ranged from 59 percent in Mack’s district to 74 percent in Doyle and Lance’s districts. Altman said the NRDC worked with the pollsters to develop the language of the questions. They used quotes from detractors of the EPA such as the American Petroleum Institute and the National Association of Manufacturers to use as the con case and quotes from health organizations such as the American Lung Association and the American Public Health Assocation to explain the case for the EPA. The districts polled are a good cross section of America racially and politically, said Jensen.